In a speech to Russia’s political establishment on March 18, the Russian president addressed the crisis in Ukraine and the position of Crimea. 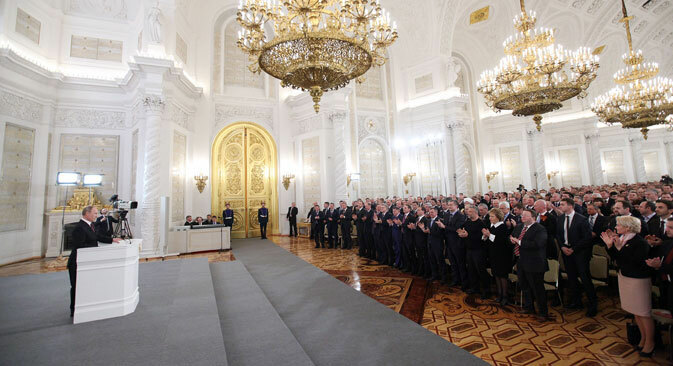 On March 18, Russian President Vladimir Putin made an extraordinary address to Russia’s Federal Assembly in which he discussed the situation in Ukraine and the annexation of Crimea. The entire text of the speech is available in Russian. Here are RBTH’s top 10 takeaways. Putin said the fact that the decision by Soviet leader Nikita Khrushchev to transfer Crimea from Russia to Ukraine in 1954 was in violation of constitutional norms, even if the ones that existed at the time were not perfect. “This decision was made with obvious violations of the constitutional norms, which existed even at that time. The issue was decided behind the scenes, behind closed doors,” Putin said. “All these years, citizens and many public figures have repeatedly raised this issue: they have said that Crimea is a native Russian land and Sevastopol is a Russian city. Yes, we understood all this, and we felt it with our heart and soul, but it was necessary to proceed from the existing realities, and to create good relations with an independent Ukraine on a new basis,” he said. “Crimea is our common heritage and a major factor of stability in the region. And this strategic area should be under strong, stable dominion, which, in fact, can be only Russian,” Putin concluded. “Time and again, there were attempts to deprive the Russians of their historical memory, and sometimes of their mother tongue, to make them an object of forced assimilation,” Putin said, adding that the need to protect Russians from this kind of behavior has influenced Russia’s recent actions. Putin said that contrary to popular belief, Russia does not want Ukraine to fall apart. “I want you to listen well, dear friends. Do not believe those who are trying to scare you with Russia, those who are shouting that other regions will follow Crimea. We do not want the division of Ukraine. We do not need this,” Putin said. Putin continued to place the blame for the violence in Kiev in late February on the actions of extremist groups with Fascist beliefs. “Nationalists, neo-Nazis, anti-Semites and Russophobes were the main executors of the coup, and even today, they largely determine the life in Ukraine,” Putin said. According to Putin, the members of the interim government in Ukraine are not legitimate officials and so there is no government to negotiate with. “It is also clear that there is no legitimate executive power in Ukraine yet, there is no one to talk to,” Putin said. Putin does not appreciate the moves made by the United States and the EU in reaction to the revolution Kiev and the referendum in Crimea. “In the case of Ukraine, our Western partners have crossed the line, they were rude, irresponsible and unprofessional,” Putin said, adding that in the case of Crimea, Western countries were aware of the Russians living there and the region’s ties to Russia. “Russia found itself on a line, from which it could not retreat,” Putin said. Putin called the statements made by the EU and U.S. that Russia is violating international law “amazing cynicism.” According to Putin, the situation in Crimea is similar to the recognition of Kosovo’s independence by the Western powers. Putin also cited the declaration adopted by the United States in connection with the situation in Kosovo. The document acknowledged that the declaration of independence may violate the domestic laws of a country, but this does not mean that there is a violation of international law. “They wrote this themselves, trumpeted it to the world, and now they are indignant. Why?” Putin said. “Today, we are threatened with sanctions, but we already live with a series of restrictions, very significant for us, for our economy, and for our country,” Putin said. He recalled that during the Cold War, the United States and other countries banned the selling of a large list of technologies and equipment to the Soviet Union and that this ban has been only formally abolished. “We are grateful to everyone who treats with understanding the steps we have taken in Crimea. We are grateful to the people of China, whose leadership considered and is considering the situation around Ukraine and Crimea in its historical and political entirety. We highly appreciate the restraint and objectivity of India,” Putin said. He also appealed to the Germans and reminded them that when East and West Germany decided to unite, not all countries supported this initiative, but the Soviet Union fully supported the historic move. “I am sure you have not forgotten this, and I hope that the citizens of Germany will also support the aspirations of the Russian world, of historical Russia to restore its unity,” Putin said. Based on materials from Interfax and RIA Novosti. For many Russians, the current crisis in Ukraine is not just a political issue.